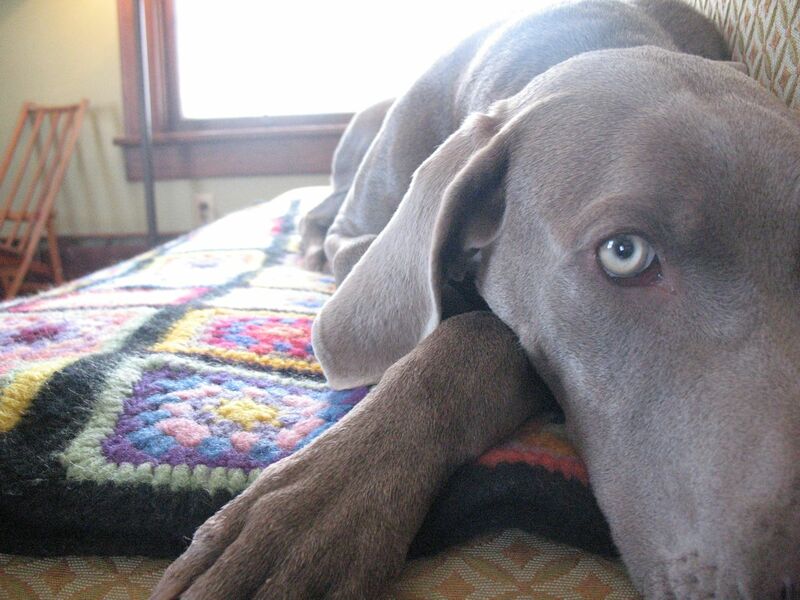 we read recently that weimaraners are dogs that like to be a part of the family-every part. so true of our deal sal. she assumes her position in any activity we’re doing until told otherwise…oh, supper time? great. laundry? great. trampoline? great. sitting on the couch watching tv? great. Very sweet! You are never alone! Really, that is ANY dog. Bailey wants to be everywhere with us. Drive to the grocery store, watch TV, pee, cook, etc. Dogs are man’s true unwavering companion for that very reason. Good Sal. Good dog! Herbie, our Aussie/Hound mix is the same way. He follows me around the house all day. He does the same thing with Nolan. We have to make sure that he knows the order of the pack….Nolan, Nancy, Georgia, then Herbie. He thinks he should be first for everything. And yes he would crawl up in our laps if we let him….all 65 lbs of him too! But I would rather have it this way than anything else. Oh, Pumpkin! Sal, I want to snuggle up with you on that cozy afghan!